These are typical properties for the standard sodium polyacrylate. Potassium, ammonium or other salts can be provided to special order, as can the un-neutralised acid. Acriflow products may be used to increase the solids loading of the required mineral dispersion, or to reduce the working viscosity at a given solids content. This increases process efficiencies and reduces costs. 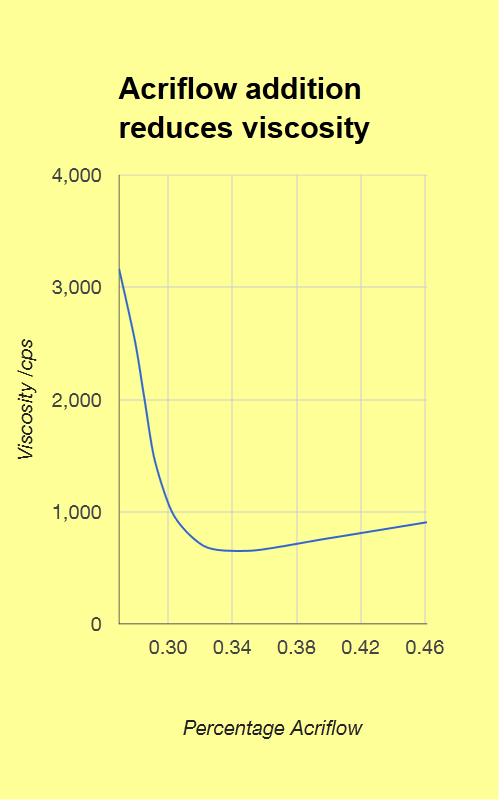 Optimum conditions for each application can be determined by the preparation of viscosity-concentration curves as illustrated below. In water treatment applications Acriflow assists in the prevention of scale formation, thereby improving operating efficiency and reducing downtime. Other benefits that have been observed include rapid wetting-out, finer dispersion characteristics, higher solids loading, improved stability and lower fuel costs. We recommend Acriflow 041S as our workhorse dispersant of choice, but some applications see increased benefit from slightly different polymer chain lengths. To that end we offer a lower (Acriflow UL2) and higher (Acriflow 141) molecular weight product. For applications requiring a significantly higher molecular weight, we offer Acriflow 641-S. We also offer ammonium polyacrylate and the un-neutralised polyacrylic acids. Other salts can be provided to special order.